2007 - 2009 | Beste plan? 2010 - 2017 | We werken er aan! 2011 - 2018 | We werken er aan! 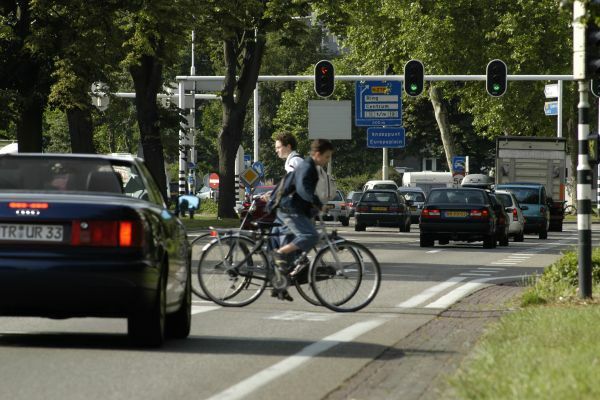 Approach of the A2 Maastricht project: a joint action plan. The A2 motorway through the city of Maastricht in the Netherlands was a thorn in the eye of the city, the surrounding area, and road users for years until a solution was proposed in 2000. The route through Maastricht proved problematic for several reasons, especially to the international motorway traffic between Maastricht and Marseilles. The Maastricht motorway was a source of daily traffic congestion due to the six sets of traffic lights. The motorway cut straight through the city, isolating the eastern part of Maastricht from the rest of the city. The A2 motorway greatly undermined the quality of life, health, and traffic safety of nearby residents. The daily traffic congestion had a negative impact on the business climate in the city and surrounding area. 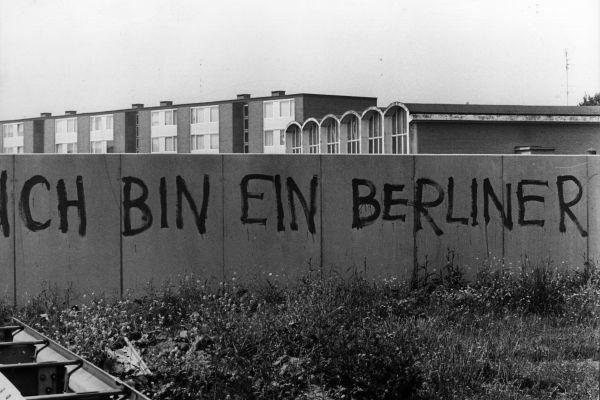 Maastricht and its surrounding area decided decades ago that the ‘Berlin wall’ needed to go. Tunnelling was by far the best option as it removed most of the traffic from the city and preserved the valuable landscape surrounding Maastricht. Due to the common desire to resolve liveability, accessibility, and mobility issues in Maastricht, the governmental stakeholders (the municipality of Maastricht, the Province of Limburg, the national government represented by Rijkswaterstaat [Directorate-General for Public Works and Water Management, the body that maintains the viaducts], and the municipality of Meerssen) opted for a collaborative approach. 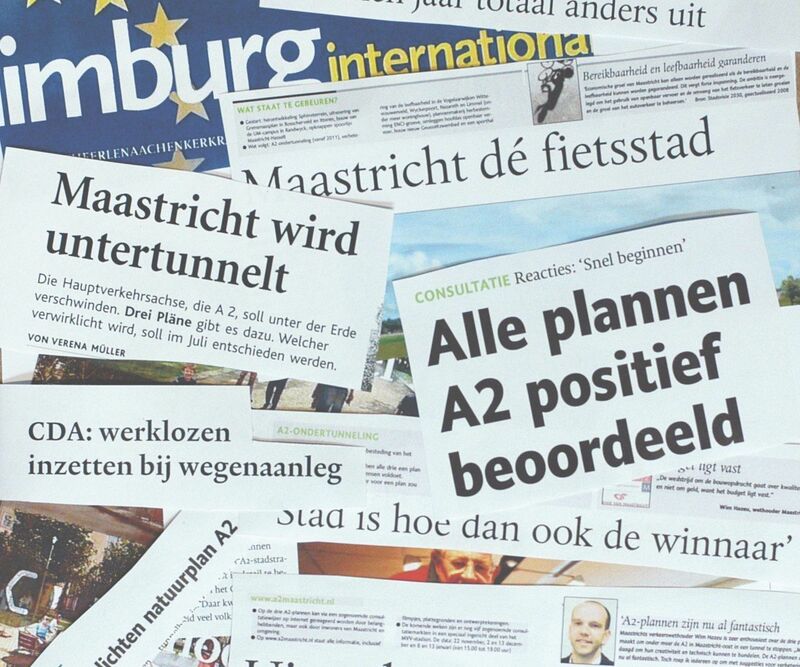 Together, they commissioned the A2 Maastricht project, contributed according to financial means, shared the risks, and collaborated to create Projectbureau A2 Maastricht and give it a broad mandate to act as the project's commissioning party. An integrated plan was drawn up to commence the assignment. Transforming the section of motorway into a tunnel was a means to multiple ends: diverting the traffic into a two-kilometre-long underground tunnel, developing an attractive residential and recreational area, improving a total of six kilometres of the traffic system surrounding Maastricht by connecting the A2 and A79 motorways at Meerssen, increasing the accessibility of the Beatrixhaven industrial estate in Maastricht, and creating new opportunities for the area surrounding the tunnel. It was an approach that combined improving the infrastructure, integral regional development, and opportunities for the surrounding area. The integral approach was also used in the Madrid Rio, Paris Rive Gauche, and Big Dig (Boston) projects. The process was structured in an innovative way as well. The parties that commissioned the project combined legal procedures such as the national government’s infrastructure procedure, the municipality's zoning plans, and the selection of contractors from tendering bids in an effort to save time. During the tendering process, they challenged bidders to come up with the best plan by hosting a ‘competitively-minded dialogue’. The selection criteria were clearly described, but not set in stone. The structure of the tender to be awarded was called Design & Construct: the contractor both designs and executes the work. The Market actors were therefore given the opportunity to come up with their own solutions. The amount they would receive for the project was pre-determined. Quality was therefore the decisive factor. The winning bid was not only awarded pre-determined a cash sum to design and construct the integral regional development and infrastructural works, they were also awarded a property development project including over nine hundred houses. 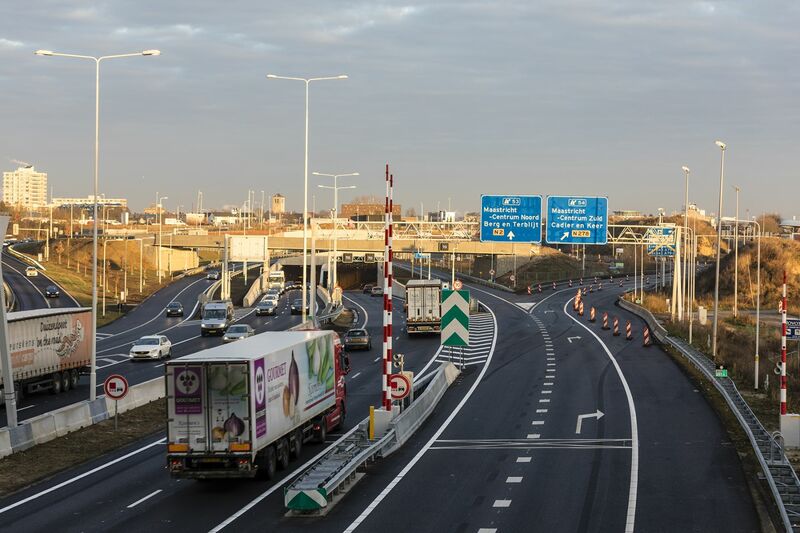 The A2 Maastricht project therefore represented a total investment of 1.2 billion euros. A simplified reproduction of the six kilometres of traffic system for the A2 Maastricht project between the Kruisdonk and Europaplein junctions. The 2.3-kilometre-long tunnel is a part of this. The innovative tender was awarded to Avenue2, a consortium of the building companies Strukton and Ballast Nedam, in early 2009. Their ‘Groene Loper’ (Green Carpet) plan was deemed to be the best of the entries. Avenue2 designed a double-decker tunnel that separates regional and local traffic and diverts more cars underground to create more usable land above the tunnel for a pleasant public space and living environment. 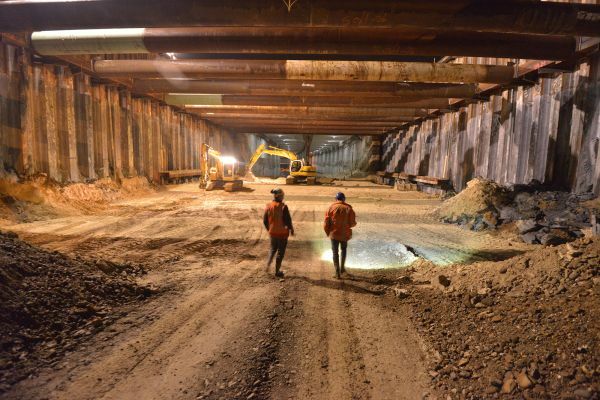 The double-decker tunnel also reduced the size of the excavation site meaning that the motorway could be temporarily moved next to the excavation site, ensuring the continued flow of traffic during the construction work. This was a particularly important prerequisite for all bids in the tendering process. The second aspect of Avenue2’s winning bid was the ‘Groene Loper’, a wide pedestrian and cycling route on top of the tunnel, connecting the northern part of Maastricht to the Geul & Maas country estate area, which is a place of cultural-historical and topographical importance due to the rural estates and castles in the area. The ‘Groene Loper’ project adds value for Maastricht residents by increasing the recreational activities available to them. 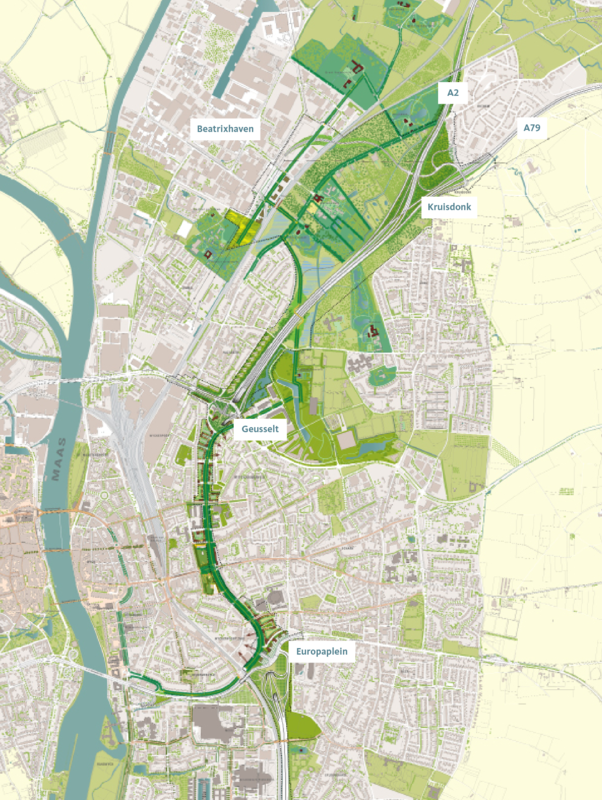 Look at the map of the plan for the Groene Loper (2009). An illustration of the double-decker tunnel and the Groene Loper, from Avenue2's plan (2009). The most unusual thing about the tendering process was that the three competing parties presented their proposals to the general public before a winner was selected. Residents of Maastricht and the surrounding area were able to give feedback on each proposal. 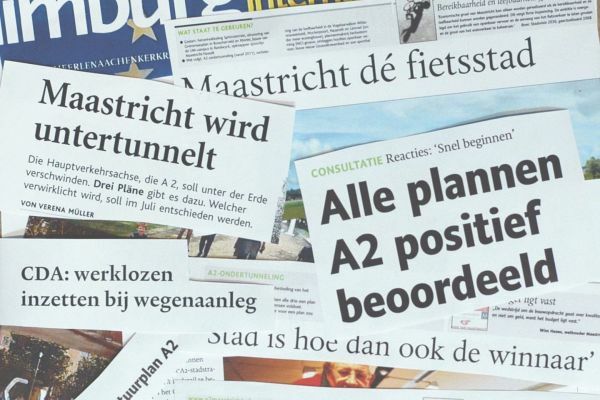 Local neighbourhood representatives and businesses were also involved in discussions, leading to Projectbureau A2 Maastricht forwarding approximately 3,500 responses to the bidding parties specifying whether to incorporate, ignore, or consider each piece of feedback. The voluntary consultations with the general public, neighbourhoods, and businesses was a bold move by Projectbureau A2 Maastricht that risked endangering the level playing field of the tender. Thankfully they maintained a level playing field being by diligently coordinating the consultation process. 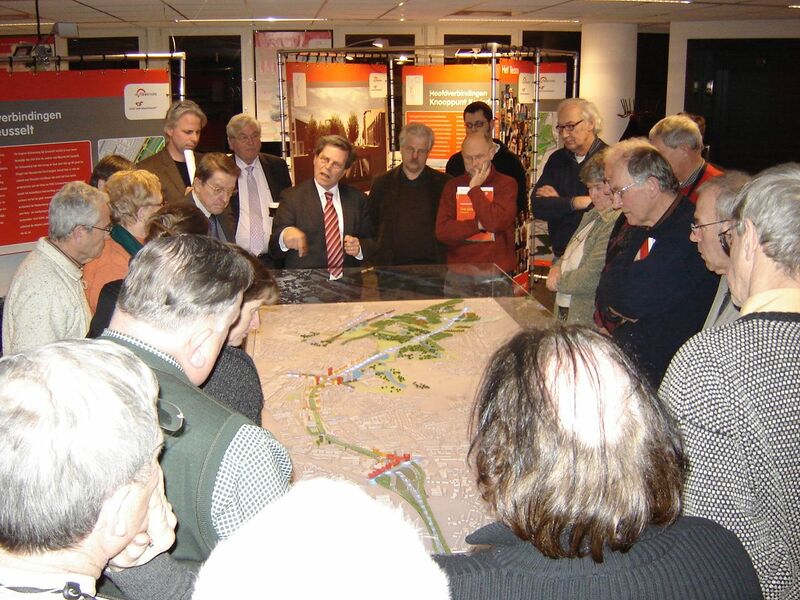 This also resulted in the additional benefit of giving the residents of Maastricht and the surrounding area a sense of inclusion from a very early stage of the A2 Maastricht project. During an extra round of consultations, everyone was able to review the plans of the three private companies and respond to them. This inclusion only increased as the project entered the execution phase. Projectbureau A2 Maastricht focused heavily on communicating with the surrounding area. Something very unusual in projects of this scale happened in early 2012, when Projectbureau A2 Maastricht and Avenue2 decided to combine their means of communication and only communicate with one voice. It paved the way for more focused communication which improved the inclusion of the general public in the A2 Maastricht project story in several ways. Stakeholders received weekly updates on what was happening in the excavation site and how work was progressing in video format. Weekly progress messages were sent out by post as well as included in information bulletins sent out with local newspapers. Each year the construction site was open to the general public for a weekend, including presentations in the Information Center A2 Maastricht and tours outside. 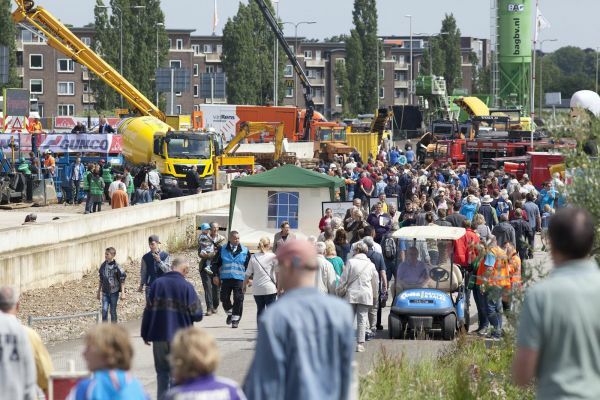 120,000 people in total attended the A2 Maastricht project. The initial fears regarding such a large building project in the city slowly changed into admiration as a result of the communication strategy. The local residents even came to embrace the project. Many people visited the construction site during the annual open day. Construction workers shared stories about the ongoing work in the weekly information section on regional television. The collaborative communication strategy was an excellent fit for the A2 Maastricht project’s ‘Best for Project’ philosophy. Projectbureau A2 Maastricht maintained a very close working relationship with the contractor Avenue2 from the very start. The board of directors and management shared their concerns on a weekly basis. Their basic principle was that the construction works were not allowed to stop, in order to prevent excess expenditure on the part of the contractor, and inconvenience to the local residents. The risks were closely monitored and clear agreements were made on how to deal with extra work. The Best for Project philosophy is evident in many aspects of the A2 Maastricht project. The way in which the permits were granted is a stand-out example complementing the collaborative communication strategy. The A2 Maastricht project required 640 permits in total. All the applications were processed with machine-like efficiency thanks to the clever way of managing applications. In addition, no notices of objection were submitted against the permit applications. All of the factors mentioned above proved to be the foundations of a successful project. The A2 tunnel in Maastricht opened to the public on 16 December 2016, the exact date specified in Avenue2’s contract. The governmental stakeholders did not exceed their budgets. The flow of traffic through Maastricht by way of the A2 was not measurably worse than before the project started. The tunnel functioned as planned when it was opened. The A2 Maastricht project also provided its share of firsts, such as applying the observational method to monitor the progress of the ongoing work in the excavation site during the digging process. This precaution was deemed necessary because no-one had ever built a tunnel in the marl subsoil of the Maastricht area. The creation of the Ready to Operate team was a first, as the stakeholders who would use the tunnel began collaborating well in advance of the tunnel actually being opened. Yet another first was employing traffic psychologists to help flesh out the road designs. The road to success was also paved with difficulties such as in 2015, when both building companies that comprise Avenue2 suffered financial setbacks. Testing the technical traffic and tunnel equipment did not go smoothly. The A2 Maastricht project encompasses the stories of many people as well. In spite of the scale of the construction works, special attention was paid to initiatives and special requests submitted by the local residents. The Ronald McDonald-house in Maastricht was granted the opportunity to organize a fund-raising dinner. The priest of the church next to the tunnel route introduced Barbara as the patron saint of tunnellers and construction workers. Machinery was turned off during weddings and funerals held at the church. Construction site watchers, often local pensioners, were unhindered as they eagerly followed the progress of the project. Terminally ill patients who may not have survived to see the tunnel completed were given a tour of the tunnel at their request. A fundraising dinner in the tunnel for two local Ronald McDonald houses. Even once the public space is completed in spring 2018, the A2 Maastricht project will still not be completely finished. During the next few years, new sustainable homes will be built next to the Groene Loper. The utmost care will be given to ensuring that the opportunities afforded by the Groene Loper will be pursued. The four commissioning parties will continue to work together in Projectbureau A2 Maastricht to maintain the integral approach for the future. Looking back, the A2 Maastricht project is a source of inspiration in several ways for similar projects in the Netherlands and abroad, due to both its innovative approach and the exceptional cooperation inspired by the Best for Project philosophy. The A2 Maastricht project has produced a result that few could have anticipated in advance including: resolving a major bottleneck in the Dutch motorway network, re-connecting the city of Maastricht, improving the connection to the green area, reaffirming pride in the city and region, improving an entire traffic system, and even affording new opportunities to residents of nearby neighbourhoods.